In this program, we provided no-interest loans to organizations and villages for them to buy motorcycles to use as moto-taxis. These moto taxis transported patients for clinics and supplies by day and were used as moto-taxis at night to earn money. The village of LaSource still uses their motos on a regular basis, using them as moto-taxis at any available time when they aren’t needed for something more dire. A small percentage of the proceeds from the moto-taxi business is set aside for repairs, a small percentage is used to pay back the NO-interest loan from One Hundred For Haiti, and then the balance is kept by the driver and the village/organization. We can’t stress enough that this is a NO-INTEREST program. Unlike other micro-loan programs which profit from the work they do, no one at One Hundred For Haiti wants to make money from the Haitian people. The money they make is theirs to keep. When we are fully repaid for the moto, the title to it becomes the recipients and we use that money to buy another moto elsewhere. 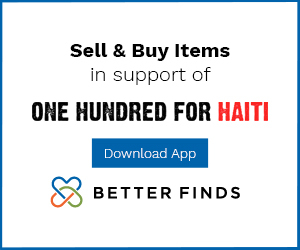 In Moto Logistics, One Hundred For Haiti buys one or two motorcycles on no-interest loan for a target recipient in rural Haiti. The village/clinic will use these motorcycles by day to save money through being able to deliver supplies, medicines, and patients, themselves and then will be able to earn money by night as the motorcycles are used as the principle vehicles of private motorcycle-based taxi services. The profits from the taxi service will be split, with a percentage going to a repair fund for the motorcycles, a percentage going towards repayment of the loan for the motorcycles, and the remaining percentage going to the village or organization itself. The recipient organization can decide what percentage of that amount will be retained by the organization, and what percentage will be profit for the driver. “In essence, the Moto Logistics program creates jobs, saves money and time, and most importantly is self-sustaining due to the no-interest loan component,” said Holli Griffiths, with One Hundred For Haiti. 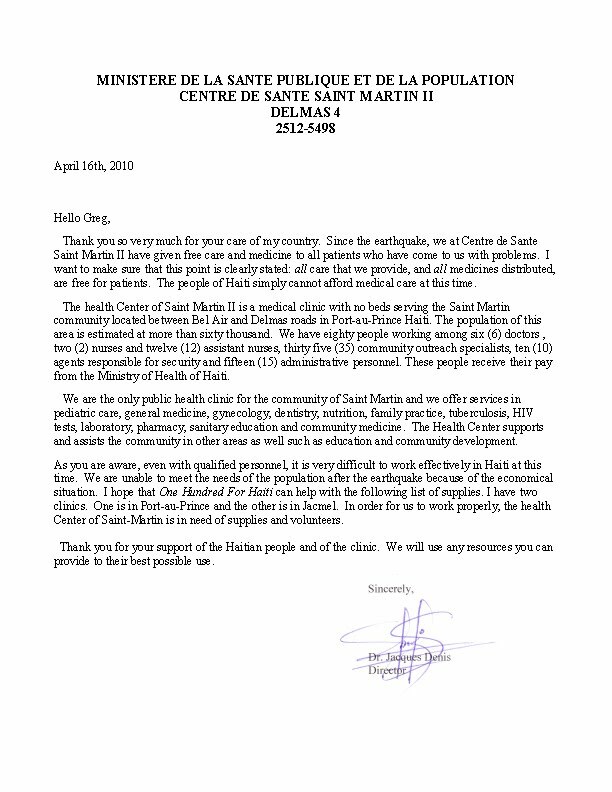 One Hundred For Haiti worked in conjunction with Dr. Jacques Denis, the director of the Centre de Sante St. Martin II, a medical clinic in Port-au-Prince. 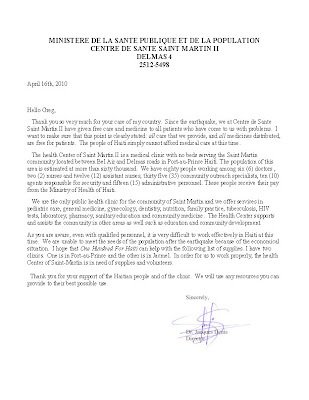 We first met Dr. Denis in the summer of 2008 in Port-au-Prince. He explained that he’d been serving the Delmas 4 neighborhood and its sixty thousand inhabitants for over ten years. After the earthquake, when we went back to Haiti, we stayed with Dr. Denis and visited the clinic where he worked for all those years. The parking area in front of the clinic was filled with patients and we were told that these people would not go inside the building for fear of another earthquake, so they were being treated in tents outside. What differentiates this clinic and Dr. Denis’ work from others is that after the earthquake, Dr. Denis gave away medicine to people in need who could not afford to pay. 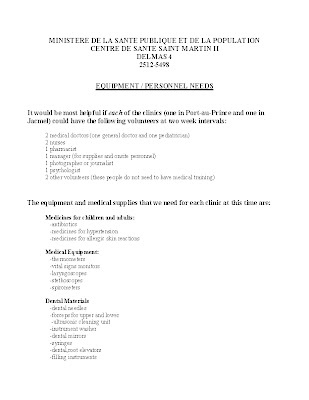 We promised to help him with this work, and have come through by stocking the shelves of this medical clinic with medicine and supplies as well as the clinic in Kenscoff (a region high above Port au Prince). One Hundred For Haiti also paid for structural repairs to the building itself, which was damaged in the earthquake. This is essential because of the widespread fear in Haiti that another earthquake is imminent. People, even when sick or injured, did not want to enter the clinic for fear of the building collapsing on top of them. The repairs to the cracked walls and stairs gave reassurance. One Hundred For Haiti also paid for an examination room to be added to the clinic in 2011 as well as a security door in 2012. All of these building initiatives utilize Haitian labor, paid fair wages, so that those workers can provide for their families. As one man told us while we were there: “Even more than money, we want a way to make money.” Providing jobs is one step towards sustainability. We have a letter from Dr. Denis (from 12/17/2011 and even thought it is dated from two years ago is still quite current for ongoing needs), including a list of the supplies he would like. We’ve reprinted it below. 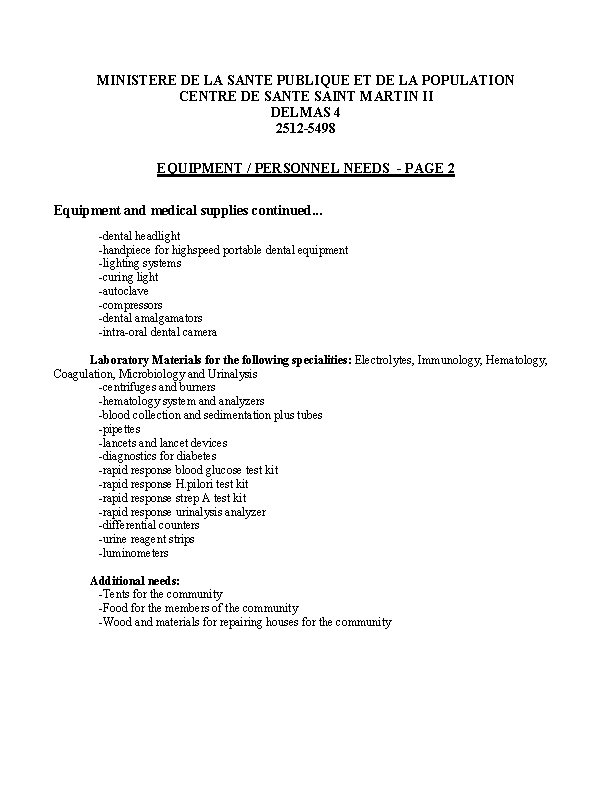 If you have access to any of these supplies, or know of anyone interested or able to volunteer for two to three weeks in any of the capacities listed in the volunteer section, please contact us. Kay Angel, Creole for Angel House has as its mission to provide a home and education for children infected or affected by AIDS in Jacmel Haiti, 25 miles south of Port au Prince. The orphanage opened its doors in 2007 and is now home to 13 children. 5 are HIV+; 2 are severely handicapped; all are lucky to be alive. They are the fortunate exceptions to the estimated 225,000 child slaves in Haiti, children as young as five years old who lost their parents and are now forced to work just to survive. Before her untimely death, the orphanage’s director, Lia van de Donk, and her local staff cared for the children 24/7. That work continues. Half of them are of school age and visited either the local kindergarten, a school for the handicapped or were taught by own private teacher – until the earthquake destroyed all three facilities. One Hundred For Haiti supported Kay Angel by providing school supplies, and provided medicine and other needs. Support for Kay Angel comes via private donations, from people like you. During our visits to the rural village of La Source, both to survey the damage from the earthquake and to deliver food after arriving on the Liberty Schooner, we became good friends with village resident Chrismedonne Lajeunesse, brother of Josue Lajeunesse who we’d met in the USA prior to the earthquake. As the year has gone on, we’ve connected with Chrismedonne to insure delivery of over two thousand pounds of rice to the village. Prior to the rainy season in 2011, we heard from him that the roof of his extended family’s home had been damaged and was leaking constantly. We offered financial support for a new roof and in conjunction with Josue, paid for supplies to be purchased in the nearby city of Jacmel, so that Chrismedonne could use those materials to put on a new roof and insure that his family stays dry throughout the year. In May 2011, we visited Haiti and the village and saw firsthand what the power of our donors’ generosity had created. The new roof looked great, and Chrismedonne was very happy with the results. A year before the earthquake, Greg was fortunate to meet Josue Lajeunesse while producing the documentary a documentary about wisdom seen through the eyes of custodians at prestigious universities. Josue is the custodian at Princeton University and his family is from a small village in Haiti called La Source. As news of the quake came in, Tyson and Greg were in Seattle trying to find out about Josue’s family, thinking of how to get to them, and hoping for news. As it turned out, Greg sailed to Haiti on the Liberty Schooner to deliver food and supplies (see story elsewhere on this site), and also to see if he could get to Josue’s sister who had been injured in the quake. Posting constantly to Facebook led to an anonymous donor offering $1400 to get Josue’s sister into a private medical clinic, and Josue’s daughter evacuated to the Dominican Republic and then to New York City where she was reunited with her father. 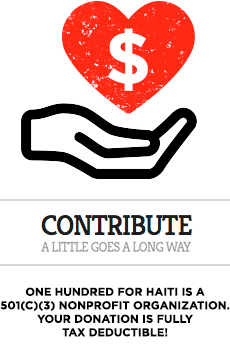 These events were early catalysts for the official foundation of One Hundred For Haiti. The wheels were in motion the night of the quake, and fueled by the facebook posts about the situation, but it was that first donor who set the tone for all that was to come. Anith survived her respiratory illness and we filmed her sincere thanks to the donors of One Hundred For Haiti months later. 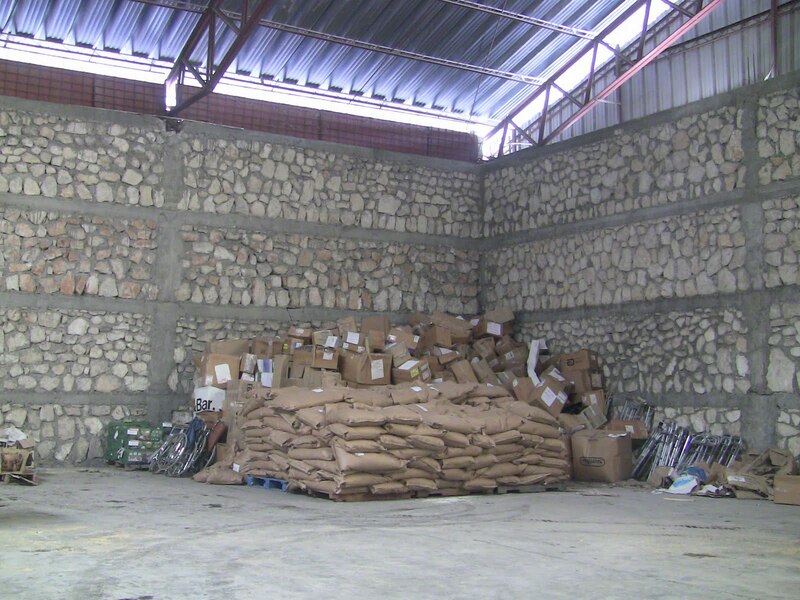 In the spring of 2010, One Hundred For Haiti arranged for the donation, transport, and deliver by sea of 35,000 lbs of food, tents and medical supplies from the United States to Carrefour Haiti. After helping to secure a massive donation of rice, we had that rice sent from Little Rock Arkansas from our donor to Florida, where it sailed to Haiti aboard the Schooner Halie and Matthew. Upon arrival, One Hundred For Haiti navigated the necessary customs/import legalities through a newly developed network of in person relationships. These connections allowed for the supplies to make it safely through and into the country where they were then distributed to people in need.